Naruto 518 Spoilers by Ohana. Omoi’s anxiety fades as he gets serious!! 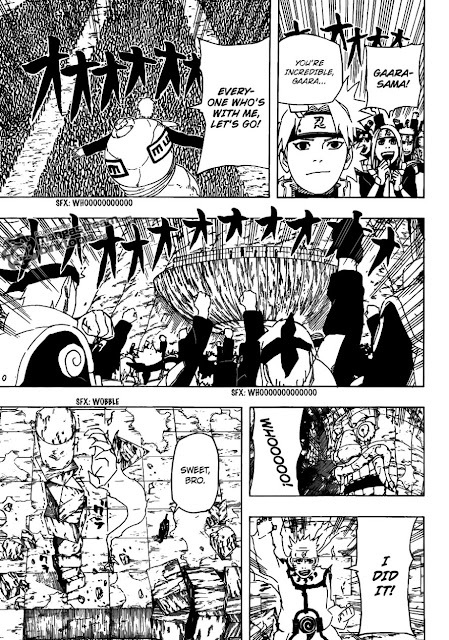 Deidara : “Hey, this is war!! Don’t be saying nice things, yeah!! The ambush unit (Kankuro’s) flees from battle. Deidara: “Good movement. But attacking us (the zombies) is useless. Omoi: “Cloud style: URAGIRI! !” (uragiri = Betrayal / treachery). He cuts Sasori’s chakra threads. Kankuro notices that Sasori’s chakra strings have been cut, and connects his own chakra strings. Ittan: “OK! Earth Element : CHIDOUGAKU!!”. The ground shifts and rises. Sasori is dragged down. ” I didn’t expect you to attach your chakra strings to mine… You’ve improved your technique a little, Kankuro”. Kankuro: “I really appreciate the praise from a master puppeteer, but i’m better than you!” Kankuro pulls out Sasori’s puppet scroll. He summons Sasori’s body. Sasori: My puppet? No matter, I don’t really care. Now I have a body that cannot be destroyed. This is the body i’ve always wished for. 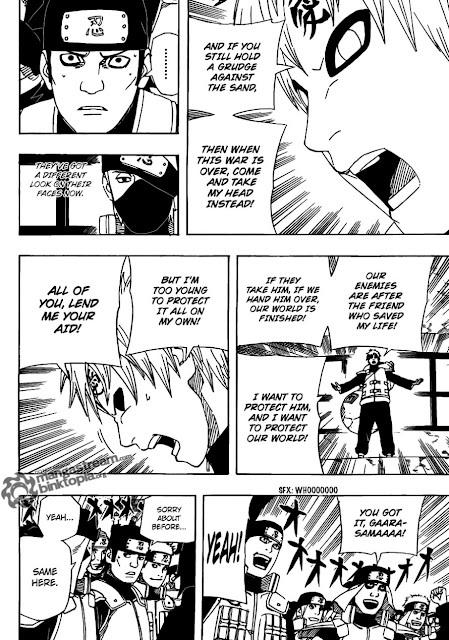 Sasori connects his chakra strings to Sai’s brother. Sai’s brother: “Run…” He gets on Deidara’s bird. Kankuro: “Ittan, use your earth technique to protect the wounded!! If you cut the chakra strings, then Omoi can join the battle. Kankuro “NOW! Kankuro’s Sanshouuo (salamander pupper) comes out of the ground and swallows Sai’s brother. He explodes. It was pretty lucky they were in the forest. The explosion? Anyhow, the reinforcements were killed / destroyed. is out of his rucksack. Deidara “I didn’t expect you to have some sort of defense puppet underground… You’re lucky that that blast wasn’t very powerful, yeah. Sai’s brother starts to regenerate. Deidara “The soul is tied to this earth, we can regenerate as often as we like… even if we’re turned into a bomb, hahahaha! Sai’s brother “I…don’t want to hurt you… …die… …even though you’ve ( or i’ve) been released from Root. 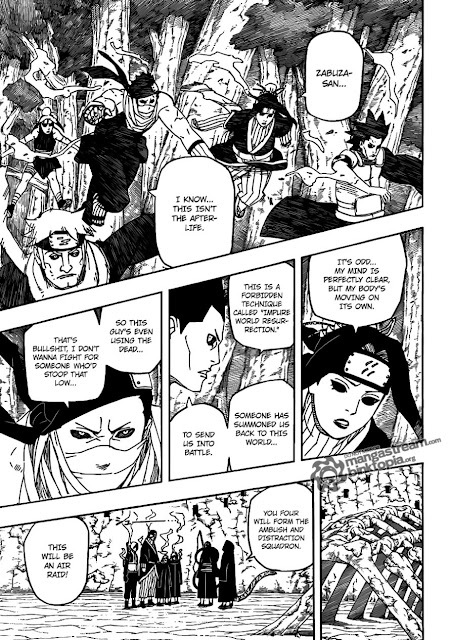 Continuation of naruto 518 chapter. Deidara “you’re pretty good with your drawing! Art’s a blast! Well then, lets go another round! Sai silently takes the brush. 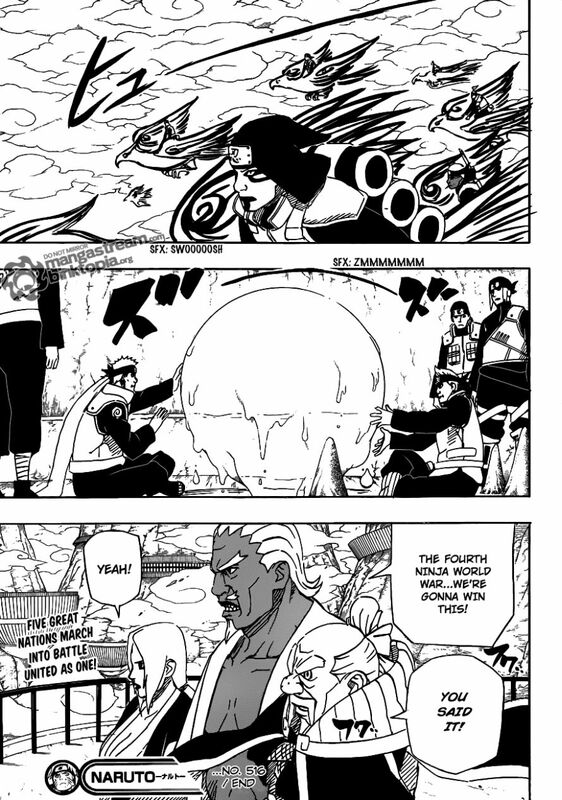 Sai summons (like his ink animals) the Thunder God and the Wind God. Sai "Brother, I've got something to show you... but it's not finished yet, please wait a little longer..."
The Thunder God and the Wind God attack and push back Sasori and Deidara. Kankuro uses his 'Black' secret technique (his puppeteering technique I assume, he was talking about Sasori's 'Red' technique earlier). Deidara and Sasori are trapped inside his puppets (Kuroari and Karasu (Black ant and Raven) ). Deidara "****! I should have just used a suicide attack! I'll use my ultimate art, I can use it as many time as I want now! Yeah. 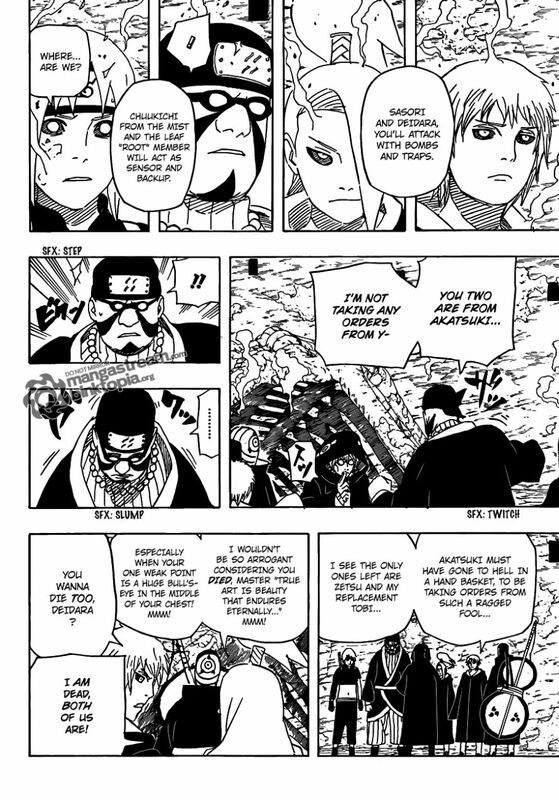 I assume Deidara is opening the mouth on his chest (to ready his suicide attack). A lightning attack ripples through. 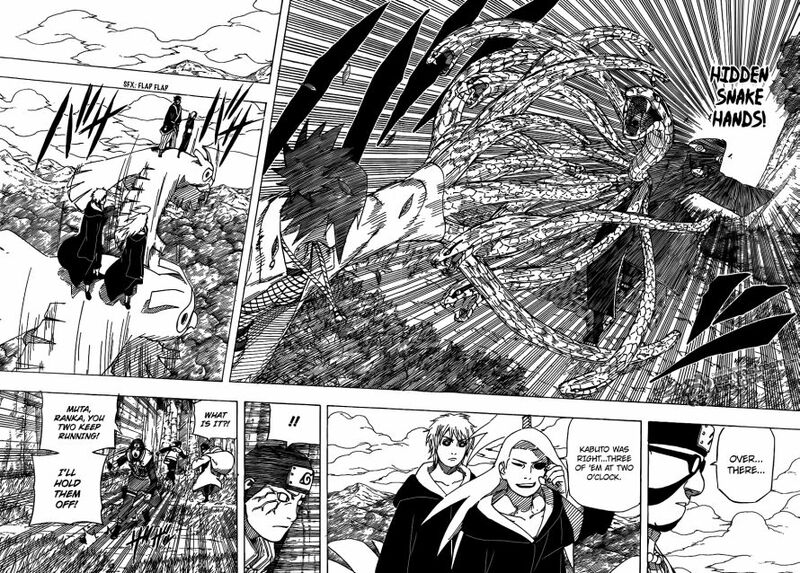 Rope covered in poison comes out of Kankuro’s Sasori and wraps around the puppets. 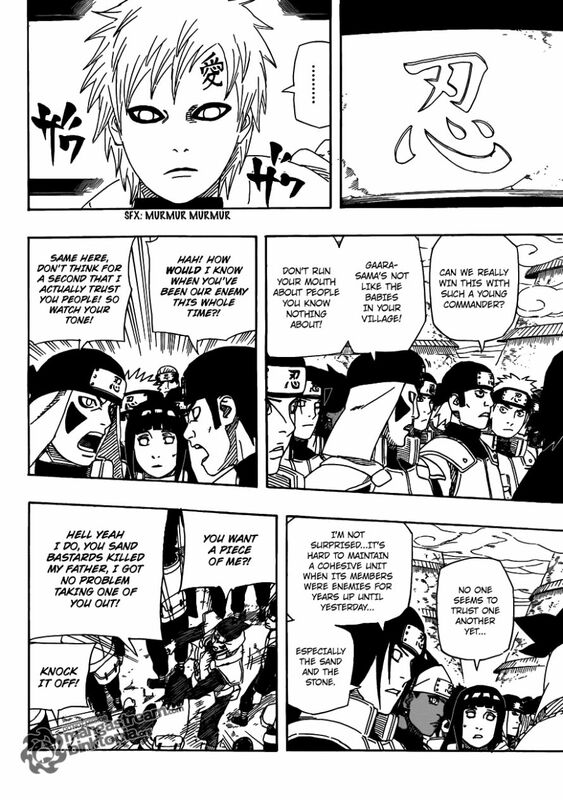 Kankuro “Well done Omoi! Now I can definately keep these guys locked in my puppet technique. Sai’s brother slowly disintergrates. He was able to see the picture. Sai has a teardrop in his eye. Sasori has his eyes closed and is listening. Kankuro “You were a master puppeteer (ninja). I didn’t expect you to be controlled! The battle of the soul…The conclusion to the ambush corps’ fight!! Naruto: Make me sad you say. Naruto: How did u do that? Bee: How you feel when the kyuubi forcefully fed you with his will. Naruto: It really hurt. I felt like I was being pushed into the centre of a pitch dark endless pain and I couldn’t do anything about it. Bee: You got to tame that ‘will’ of the kyuubi. Without it u can’t go 9 like I do, yo. It is very powerful but I know ya gonna make it powerless. Naruto: Ya, even when I took the chakra from him, he still had so much power. Naruto(beaming with all 32 teeth): Am sooo pumped up. Kabuto: Don’t worry, just go on ahead. I’ll take care of this. Anko: Why were u leading us your way. Kabuto: Kukuku. U noticed huh. I knew it was u so I wanted to see u again. Anko: Oh, and what a nice welcome present u have for me. Kabuto: What do u mean? Anko: I have hunted Orochimaru-sama all my life with just one goal, to kill him. I wanted to be the one to kill him so I was mad when I heard he was taken down by Sasuke. But it seems fate always wanted me to be the one to really do it by giving me a second chance. He has delivered him into my hands. He is in you right? Moreover, If I take u down, I weaken Madara’s strength. U wont be able to control those human summons anymore. Killing two bird with a stone is worth my life. Kabuto: Don’t tell me u still mad cos he chose me over you. Well if you have to know, u were no good, that’s why. Ku ku ku. Anko: This will be over quickly than I thought. Anko: Ninja Arts: Double Snake Assassination Technique. 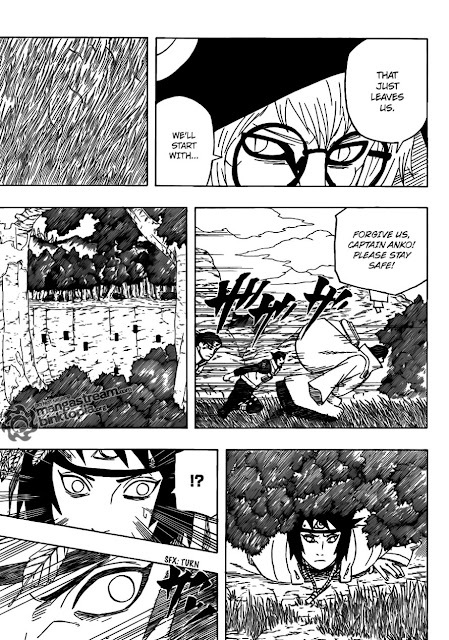 Kabuto: No way, U knew that? (As both of them start to dissolve). Edo Deidara: Told you, humh, my art is beautiful and is the best humh. Sasori: Shut it, and hurry up. Edo Deidara: Oh they are close? Humh, time to show them how my art lasts forever. Kakashi(Shouting): Sensing team, got anything yet? Random dude: Not yet Sir. 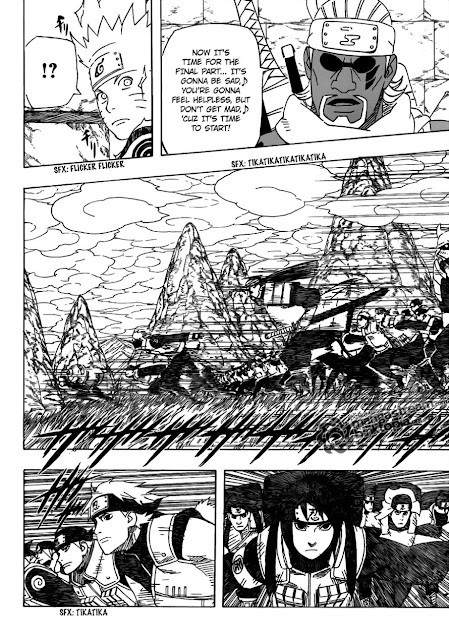 Madara: I see, this is the first assault team. Good thing I met u. What do u say, huh, tell me where the remaining jinks are, and all this will be avoided. Madara: Thought so. (raises hand) Begin. Madara: Can’t believe u didn’t notice my 20,000 army merging into your 16,000. You are not only outnumbered, you can’t trust anyone. Kabuto (appearing from somewhere else): Ever heard of the white snake’s regenerative powers. Poor girl just committed suicide. Anko: Return to the main squad and report this, quickly! I’ll stay here and investigate the hideout further. Byakugan guy: It’s too dangerous for you alone! Anko: Shaddap and just go! Zabuza: Yeah, I know. This is not the netherworld. (Probably a Kumogakure nin): This is Edo-Tensei (how famous does this supposedly forbidden jutsu get!?) Seems like we are summoned by someone, which means we’ll have to fight soon. Zabuza: Being used even in death… I hate this guy. Kabuto told someone (not made clear) to launch surprise attack from air. Sasori and Deidara would provide traps and bombs respectively. A Kiri-nin (can’t read the name’s Kanji… Chuukichi?) and Ne (Root?) from Konoha would provide detection and support. Konoha’s Ne wondered what was happening. The Kiri-nin tried to threaten Akatsuki but got subdued when Kabuto formed some seal . Sasori: To be used by this brat… Akatsuki sure has fallen. What’s more, the only survivors are Zetsu and my substitute Tobi? Deidara: As someone who died while bragging eternity as an art, you shouldn’t say conceited things like that, Danna. un. Sasori: Want me to kill you!? Deidara: We’re both dead, Danna. un. Madara: Is it really OK with this? Dan: Yeah, and we’re both dead. 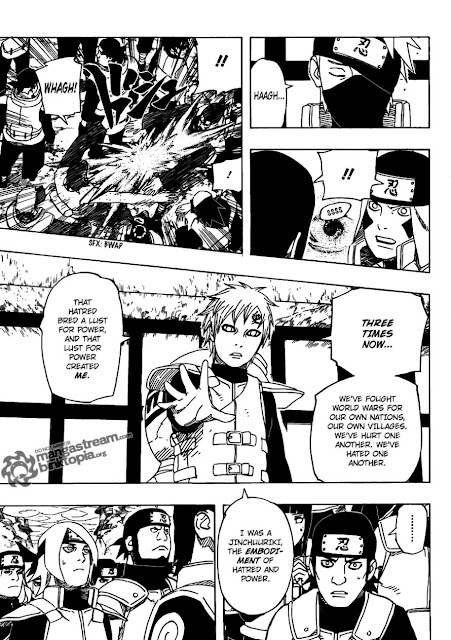 Seems like we are bound by a jutsu that resurrects us to the living world. Neji’s dad: What’s going on? Kabuto: Won’t you bring the white-black Zetsu? Madara: Zetsu will look after Sasuke. Besides, you might kidnap him in the middle of the war. Madara: The hundred thousand Zetsu will move from underground. The sheer amount would stand out too much otherwise. Byakugan guy fled. Anko remained. Anko hid among bushes, but was spotted. Deidara and Sasori are airborne on Dei’s bird. They’re with the Chuukichi guy and Ne of Konoha. 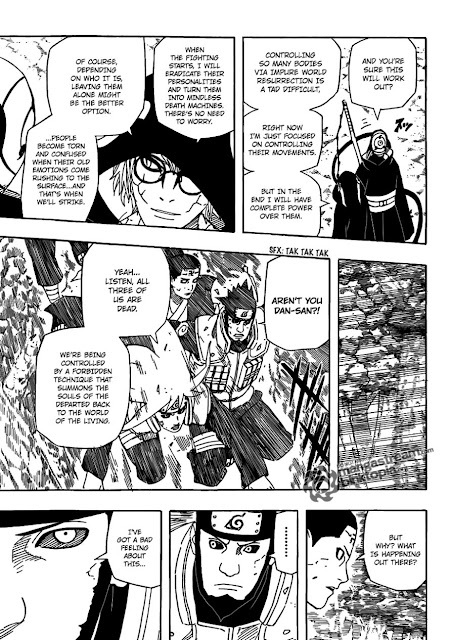 Deidara: So it’s just like what Kabuto said. Three rats at two o’clock’s direction. Byakugan guy realizes the oddity. Byakugan guy: Both of you, run! I will delay them here! Some Nins talk about Gaara and whether he’s capable of leading the squads. Some Nins started bickering with each other, fighting about whose dad was killed by whom. In the middle of the commotion, Gaara ’s sand subdued them. 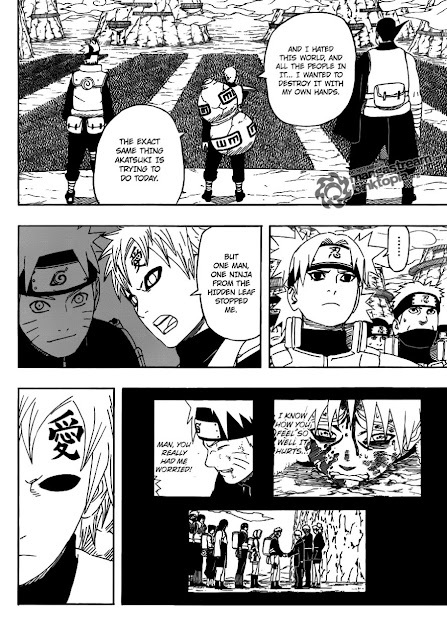 Kakashi notices that everyone’s face lit up. Naruto managed to stack up the blocks without them crumbling down. Bee talked about the last training. Raikage: We’ll win this Fourth Great Ninja World War. 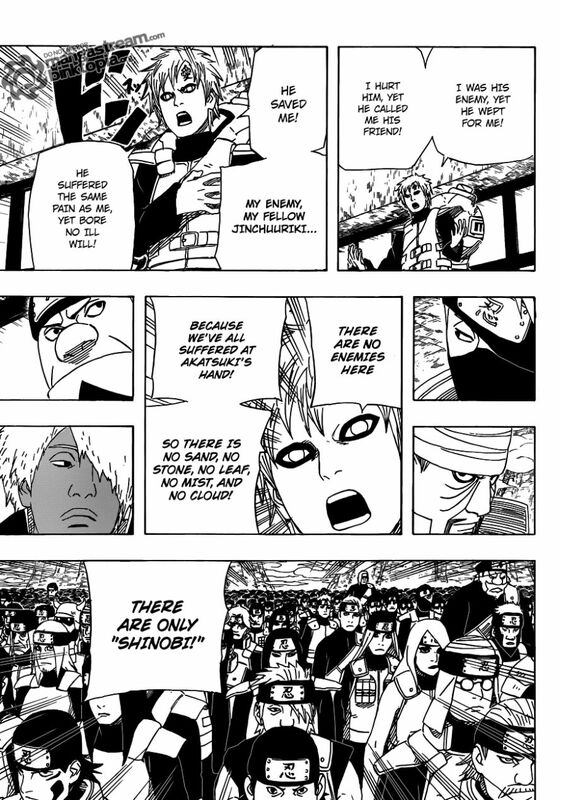 .got too much time in my hands today o.0 Will translate the part about Gaara ’s Shinobi Address. Fighting for the benefit of one’s country and one’s village has continued from the First to the Third World War. Shinobis hurt and hated each other. This hatred lusted for power, and amidst this, I was born. I too, used to live among this hatred and power; I was a Jinchuuriki. “And I hated this world with passion. I wanted to destroy it, much like what Akatsuki is trying to do now. But a Konoha Shinobi stopped me. “He cried for me, his enemy… and he called the hurt me his friend. He saved me. We were enemies to each other, and yet we were both Jinchuurikis. There is no enemy among people who understand the same suffering. 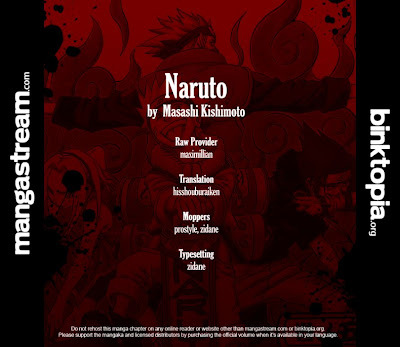 “And now, here, there is no enemy among us, because we are fellow people who were made suffer by Akatsuki. There is no Suna, Iwa, Konoha, Kiri, or Kumo. What’s here… is only Shinobi! “If even after this, you can’t forgive Suna (referring to the Shinobi earlier who bitched about his father being killed by Suna), then after this war has ended, you can take my head! “This friend who saved me is now being targeted by the foe. If he gets caught, then it’s all over for this world. I want to protect my friend… And I want to protect the world! Naruto 516 Trivia: Zabuza made a cameo appearance in a omake Naruto Shippūden episode, appearing on a lantern. He also made a cameo in a crowd shot in Naruto Shippūden episode 183 alongside Haku , Hayate Gekkō , and several Rain Ninja.